I gingerly tiptoed on shaky legs into a room with bright lights, beeping, masked doctors, verbal instructions, medical equipment and my mind swirling around and around. I saw a familiar face in my doctor and I suddenly felt better. He braced my shoulders for the pain of the spinal block and told me what he has told me everyday I have seen him since we decided to do the Cesarian, "This is going to be fun." Just as the numbness started creeping up my legs, the nervousness of what's to come also set in and I felt my fingers begin to tremble. As I laid down, I moved my eyes from person to person in the room wondering what they know, how they are feeling, what they are anticipating. Is this just another C-section for them or are they nervous too? I know they have been prepped by our situation, but you would never know it. They seemed ready and I suppose that was their job. The curtain came up and the only person that came into view was my doctor. I looked at him and I looked at the empty baby warmer to my left. It was all I could see. I knew a baby would be placed here very soon... our baby. "I know you do this all the time and you deliver lots of babies. But I want you to remember... her." The words barely came out of my mouth. He looked at me with the most sincere eyes and said, "Oh I will. I definitely will." Finally, for what seemed like forever, a warm hand held onto mine as I saw Corey slip into the chair next to me. There... my rock, my lifeline, my everything... was just a squeeze away. And I felt myself squeezing his hand over and over just to make sure it was real and he was really there. I leaned over to him and said, "Did you say one last prayer yet?" His eyes looked right through me, into my soul. It was the kind of look I could never forget. One that told me that we were in this together and forever no matter what. And he said, "I did." Knowing we were just minutes away from getting started, the anesthesiologist was whispering to me over my shoulder now and throughout the entire experience. The man whom I met just an hour before became the man without a face. I never saw him during the surgery, but I talked to him more than anyone as he kept my sensations and pain at bay. I remember my eyes beginning to dart, my face starting to wince and Corey become concerned out of the corner of my eye as he watched my expressions twist and contort. Was it painful? The most painful thing was the fear and it could have killed me if I let it creep up my neck. But the only thing I ever know how to do is remain calm. And that's what I did. I thought back to the beginning of my day when the hourly countdown began. The surreal way that I woke up the same as any other day yet with an anxious knot in my stomach knowing what was to come. I relived the season's first snowfall that occurred just hours before as the large, wispy flakes quietly fell from the sky. It was such a tangible reminder of everyone's love and grace that has fallen upon us in the last month. It was the reminder I needed to build my confidence and that was all I could do to prepare for this moment. And it came so much sooner than I was ready for. I believe that when we look back at our lives, our thoughts are remembered by a series of specific moments-- those slices of time that seemed to defy reason. Moments that lasted just another couple of seconds like any other moment in time, yet they became frozen... and it leaves me wondering... how could I have had so many thoughts running through my mind in that short amount of time? It just isn't possible. How did time revert to slow-motion and wait for me to understand and make sense of it all? It was a moment that you rerun in your mind over and over from every different angle that you never saw... only imagined. All I heard was a word, that isn't even a word. It was more like a sound. But, I would argue with Webster's Dictionary here, because with this sound, I knew she was here. And it was the beginning of a long chain of events that all went in the same direction. Coming from the assisting doctor, I heard a woman's voice and one of the sweetest sounds I have ever heard, "Awwwwwww." It was here when the new chapter began... "The Birth of Lilah Rose." The next sound I heard was the sound of our baby... and a sound that was equally as sweet. Clay was quiet as a mouse when he was born but she wailed after her first few breaths of air as the doctor held her up for us to briefly see. It was a flash and all I remember was lips and a curled up baby. She was quickly whisked into the baby warmer and my eyes followed her every step of the way. Where I thought I would see her, instead I saw a team of nurses and doctors poking, prodding, squeezing and making her scream even louder. And we waited. Waited for that sign of hope. That sign of good news. And if it was good news, I wanted it immediately. If it was bad news, I never wanted to hear the words. I was retelling these moments to my mom and I said something to her that I realized days later... never happened. It was physically impossible. But it was a part of my story I was telling. And, I was so curious how this became a part of my story, when it wasn't true. I told her that I saw the nurses and doctors smiling, and I knew everything was going to be okay. But the masks... they were all wearing masks. I could hardly see their faces. I certainly never saw them smiling. When I realized this I told my mom... and her face softened and she said, "Maybe it wasn't the nurses that were smiling... maybe it was angels in that room with you that were smiling." She was right. There was smiling. There was calm amidst the chaos. There was peace and there was so much joy. God was there and with Him, He brought His army. 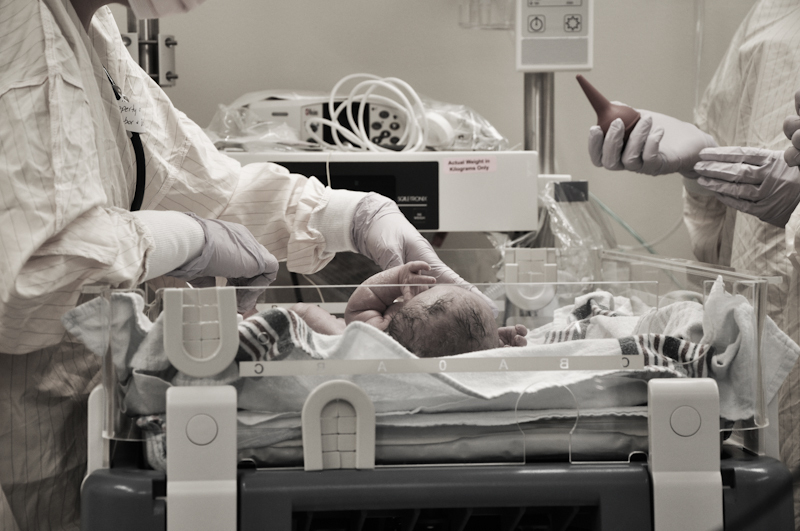 And just like at the hospital when they play a soft lullaby when each baby is born, I believe he signaled to heaven for the trumpets to begin their welcoming song, just for her. I heard my own voice call out to the nurses, "How much does she weigh?" I figured if her weight was good... she might be able to escape the NICU. Maybe. Corey and I gave it a 80% chance that she would spend her first moments, hours and even days away from us in this scary place where our naked baby would be hooked up to every machine possible. I knew the NICU was a good place for our baby to be if that was what she needed... but I also felt like it would take every ounce of my will power to not rip her away from the wires and run away with her in my arms shielding her from any pain. The nurses surprised me and called back, "How much do you think?" Corey and I looked at each other and we muttered a hopeful, "5 pounds, 2 ounces?" 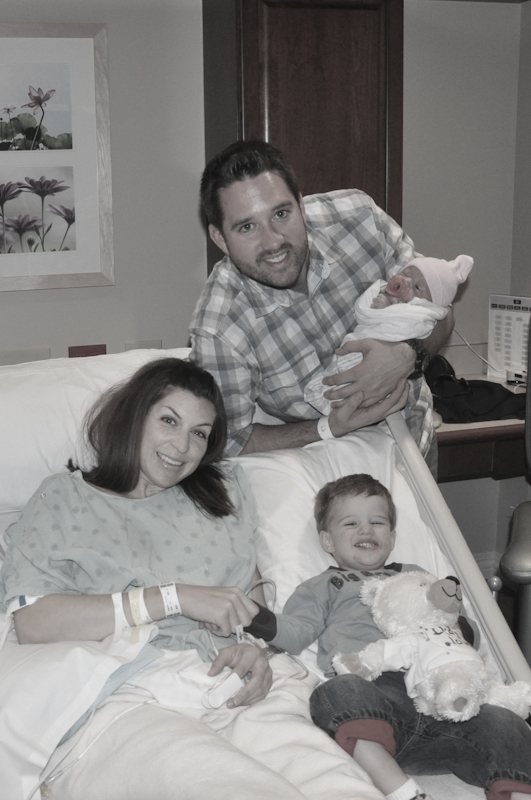 They shocked us again with an astounding, "5 pounds 14 ounces!" My first thought... the same as Clay. THE SAME AS CLAY! Oh my goodness, how can this be? It was my first deep breath where I let go of some of the fear. The room started shifting, spinning and I felt myself beginning to fade. I told the anesthesiologist that I was getting dizzy. I could hear Corey calling my name, squeezing my hand trying to bring me back into the moment. I looked up to the ceiling and had to close my eyes to prevent myself from going black. I shook my head and opened my eyes and forced them back to the baby warmer. I still couldn't see my baby and I was trying to crane my neck so I could. Right in front of my face appeared a doctor seemingly out of nowhere. She startled me and I could feel myself trying to focus on her. In this moment, I thought about her face... how kind it was and how I had never seen her before. I thought about how she looked to me like the little old granny in The Napping House, a book Clay and I read almost every night. 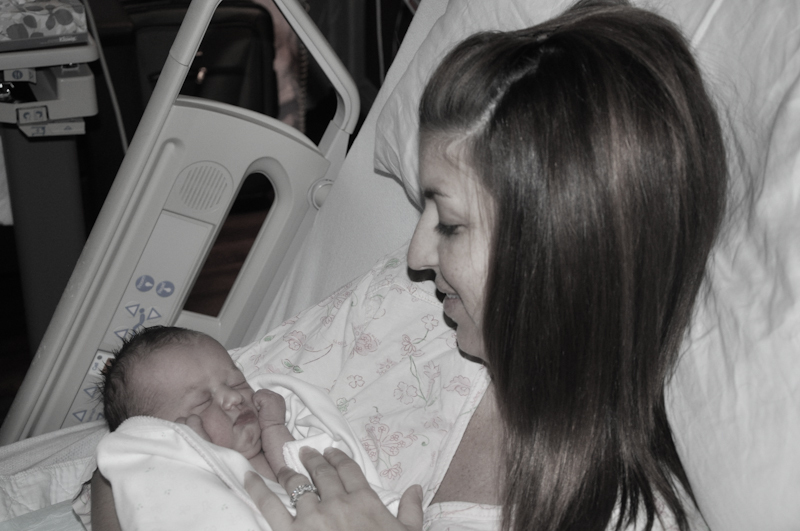 In the calmest and smoothest voice possible, she slowly said, "I am the neonatologist and at this time, I think everything with your daughter looks great and she will not have to go to the NICU." Tears. Uncontrollable tears that streaked down my face. When there wasn't anything she could say that would make things any better, she did. "I am going to bring her over for you to hold her." So many questions, so many prayers. I felt the answers were starting to be revealed in this single moment. I could feel myself let go of that second deep breath that released even more fear. I knew there were lots of tests to go, but I couldn't have been happier in that moment. Our baby was placed in Corey's arms and his face lit up like I have only seen once before. Getting to witness this meeting of a daddy and his baby girl was one of the most amazing things I have ever seen. The love, the bond, the emotion... it was so overwhelming. And then I got to see her... really see her for the first time. There she was... our baby girl. The one who had already changed me. The one who made me a fighter, a dreamer, an optimist and an advocate. She was the one who touched people's hearts and already made them love her. 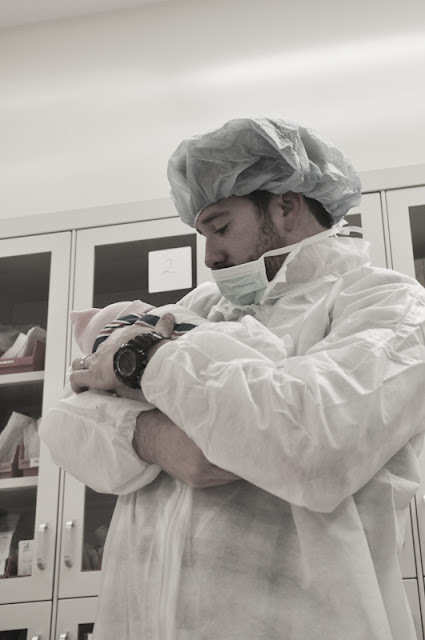 She was here... and in daddy's arms... ready to take on the world. Oh... and she was perfect. Everything from here went on like a blurry storybook. I am not sure I really took my eyes off of her to notice what was going on around me. I was in love... and that giddy love would put anyone into a foggy state-of-mind. I remember my thoughts went immediately to our families as soon as we were moved to the recovery room. Corey got the pleasure to announce to them the news of her arrival and the miracle that we had just witnessed. I could only imagine their expressions, their joy, their tears, their relief. I pictured an emotional Pawpaw overcome with the news and a smiling Nana that was jumping with pure happiness. I imagined a Grammie and Grampie that hugged their son so tight that words didn't even need to be spoken. It was right then and there where she went from being "baby girl" to... Lilah Rose. There were so many moments that followed in that short time that were just unbelievable to me. 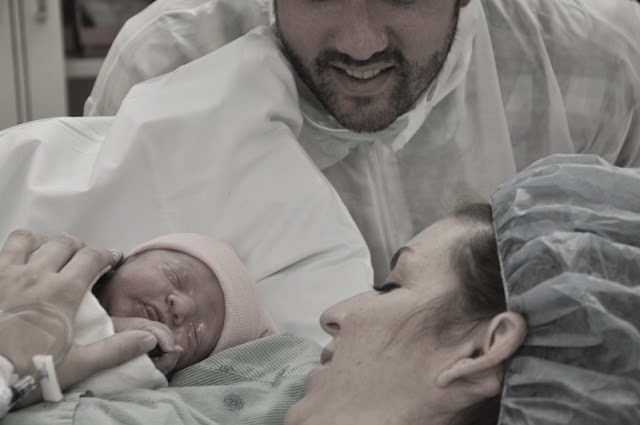 I wasn't even anticipating having Lilah with me for any of these moments, and then to get to experience them as a family... it just took my breath away. Getting to nurse Lilah, watching her first bath, the nurses continuing to give us good reports one after another... it was better than amazing. Our families flooded into our room where they brought with them so much light and happiness and pure excitement. It was Clay who had my attention as I saw him lay eyes on his baby sister for the first time. "Baby sister," I could hear him saying over and over. My heart was singing... it was hard to not flash forward time and picture the two of them, hand in hand... walking in life... side by side. He loved her and I knew this when I saw his face. He didn't care anything about what had happened the previous six weeks. Our news, our sadness, our journey, our hopefulness, our story. His story was just about love and that was it. He loved her and it would always be that way. It was the first time I saw him as big brother and the thought alone made my heart melt. The next few days were filled with an outpouring from "our village" extending their love, congratulations and enthusiasm. 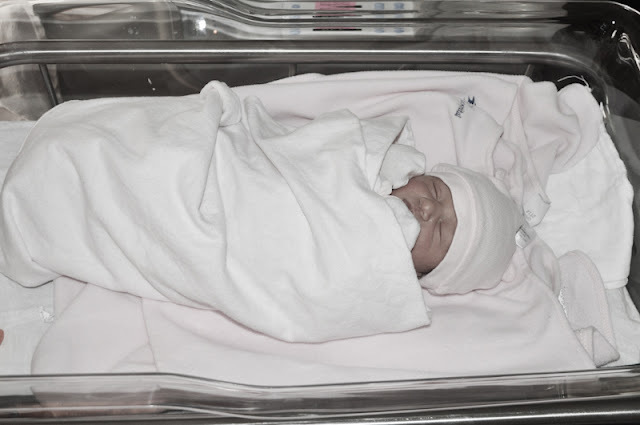 These days were also marked by more and more testing as Lilah was constantly whisked away even into the wee hours of the night for a skeletal survey, an MRI, a car seat sleep apnea test among the other testing that newborns receive. We were so thrilled that with each test, came good news until all of the fear had finally dissipated. And when our geneticist told us that Lilah looked great and he didn't foresee any additional problems, we were once again reminded of our little fighter-of-a-daughter. She was defying all odds and blazing her own path. Just like we knew she would. And it was official... a family of four. And that is what we are. We have overcome a lot of obstacles in the past couple of months. From the moment where we learned Lilah would be born with dwarfism to the present where we are beyond words and overjoyed. What a quick journey of growth, faith and love we have experienced thus far. And oh so much further we have to go. We are not done learning, changing and teaching. In fact, we have just begun. The differences we see in ourselves have been so dramatic and life-changing, we can't help but to share our story with the world. Because perhaps, our story can touch lives, and perhaps little Lilah can capture your heart. Now and for always. Beautiful story for a beautiful family!! She is so gorgeous! Congratulations! So glad to hear no additional complications!!!!!!! She is adorable!! I am so happy for your family. I just read the story to Matt - it was hard not to cry a couple of times - so beautiful and touching - thank you for opening up your deepest thoughts and private moments with all of us - I treasure the privilege of your story. Lilah Rose looks absolutely perfect! She is beautiful and I truly look forward to the day I get to meet her in person. rest up and enjoy the family. My thoughts remain with you. Oh my goodness she is so adorable!!!! I love the picture of the four of you! Hope to see you guys soon! My name is Joanna Carlin and I came across your blog through the Parents of Little People Facebook Page. I have tears in my eyes as i read your story. My story is so similar...my baby girl was born November 15, 2012. Two weeks before her birth, we were told that she had a lethal form of dwarfism and that she would expire shortly after birth. Another radiologist gave us a second opinion and told us she had achondroplasia. At her birth, we really didn't know what to expect. 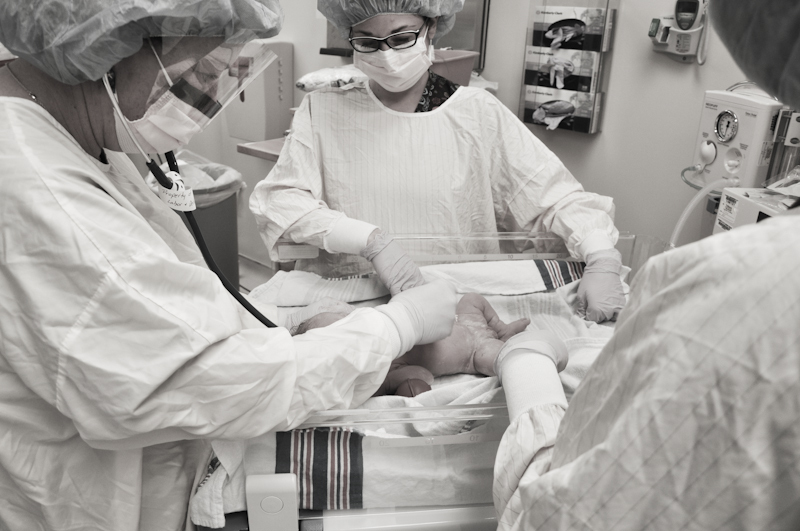 The NICU team examined her right after delivery and didn't see any complications. Our pediatricians didn't see any signs of achon and assumed the ultrasounds were wrong. At her 4 month well check, we learned that she had fallen below the growth curve. Our pediatrician sent us to the geneticist and my baby girl was diagnosed with achon. We will do a blood test to confirm her diagnosis. We also have an MRI scheduled and an appointment with a Pediatric Orthopedic Surgeon, and eventually a sleep study. Other than being small, she is developing pefectly:). This diagnosis has sent us into a whole new world...a little overwhelming. Its so nice to read stories of other moms that understand. Thank you for sharing your story. I love that our little girls are only 2 days apart...maybe they will get to meet someday! I would love to stay in touch. My email address is jcbekken@gmail.com. Beautiful story. My daughter is 3 days older than yours with Achondroplasia! what a beautiful birth story! !